The above image came to me via social network newsfeed. finding it amusing, I decided to compile a few additional SEO jokes, images, lists, and other assorted SEO humor. Please enjoy and feel free to add your own to the comments below. Update: @cun is a contender, according to Chris Combs in the comments, having sent the joke out on January 10th as well. 1. You’ve spent longer than 30 minutes crafting a title tag. 2. 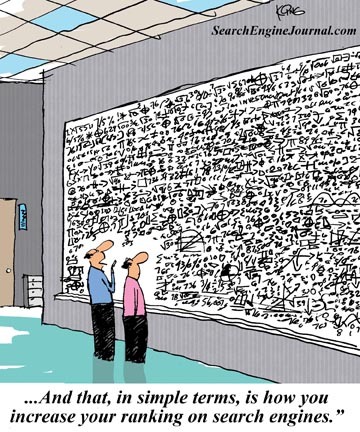 You tell your colleagues that it’s “all about TRAFFIC, not RANKINGS!”. Yet you are secretly as obsessed as they are. 3. When you’re not at work you check rankings on you’re phone, making sure to go through a proxy to get desktop SERPS, naturally. 4. You’ve been so happy that a website was finally ranking on first page… before realising you’re signed in. 5. From now on you’re OCD to check you’re not signed in, your location is set to the right place and Safe Search is set to “moderate”. 6. One day you’ll give Rich Snippets a try. Honestly, you will. 7. You do of course deplore black hat techniques… but secretly thumb up a YouMoz post that mentions a good trick. 8. You can instantly list 6 good reasons why you’re client’s developer’s idea for an Ajax site is a terrible idea. 9. You’ve gasped when a URL you’re looking for doesn’t have a Cache. “Probably just the data centers” you say, not really knowing what that means. 10. You have at least one secret SEO theory you’ll take to the grave. 11. You’re not on Facebook when you shouldn’t be, you’re “investigating how social networks have helped this piece of content spread”. Or something like that. 12. 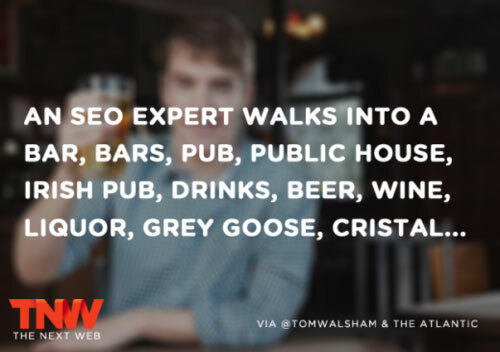 You’ve made an SEO joke to a non-SEO friend. He understood but didn’t laugh. 13. You join the WWF because of the Panda update. 14. You occasionally joke that you’ll “phone up Google” to get something fixed. You know this is hilarious. 15. You’re jealous that with PPC it is so much easier to control rankings. 16. When you see someone using Bing of their own free will, you are amazed and point at them like you’re at the zoo. 17. You have never actually seen someone click a PPC ad, unless they were testing that a landing page works. 18. You’ve scrolled up and down the original PageRank paper deciding whether to read it. You quietly clicked Back. 19. You stare at the board in your office, reminiscing of Whiteboard Fridays gone by. 20. You can spot an out of date Analytics code from 20 paces. 21. You’re half way over to Yahoo! Site Explorer before you realise it’s gone. 22. The word “canonicalization” just rolls off your tongue. 23. Infographics are your top shelf magazines. 24. Getting comments on your blog post make your day… Hint, hint.